This sample high school graduation speech was sent in by Sami from the United States, a student who graduated in 2014 and submitted her speech in order to inspire and help others. Being invited to make a speech when graduating from high school is an honor and Sami's speech, in turn, honors all those who helped her throughout her high school journey. Making good use of a well placed quote, this is a great speech that I hope will help you to confidently craft your own. 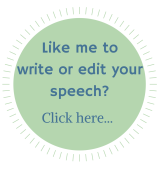 If YOU have a speech on any subject that you would like to share with visitors to best-speech-topics.com, then please complete this form. Thank you, Sami, for sharing your speech with us. Welcome friends, family, and teachers that helped me get to where I am today. It is an honor to be standing before you on such a memorable occasion. I want to start out by saying thank you to all my friends, family, and most of all, my Savior who is Jesus Christ for helping me every step of the way. It has been an amazing journey and one my fellow Class of 2014 members will most likely never forget. Four years ago, the Class of 2014 was just walking through the doors of Landrum High School and we have had many memories over the course of our high school journey. We all had one goal in mind and that was to make our mark on the school that we attended and make our mark on the world once we graduate. We all have different career choices but we're all bound by the same common cause and that is to GRADUATE! We are your Class of 2014 not just because we scooted our way past every year but because we put in the hard work and the effort to get to where we are today and we could not have done that without the friends, family and teachers constantly encouraging us to keep up the good work. It's not all about if you look good, or fit in at your school, it's about the legacy that you will leave once you graduate. Dr. Seuss once said, "You're off to great places, TODAY is your DAY, Your mountain is waiting, so get on your way!" I pray that the Class of 2014 will walk out of here today feeling proud of all they have accomplished over these last four years. And always remember, it's not about the friends that you make while you're in school, it's the memories that you leave behind that really count.